An Italia 13.98 with X-Drive taffeta carbon cruising sails. Click to enlarge. X-Drive is a two-part construction system. As the diagram shows, the sail is made from a light weight material cut into cross-cut panels that, when put together, has the 3-D shape created by the sail designer. Next, the sail is reinforced with a grid of narrow high-strength, low-stretch tapes that are bonded to the sail 11 at a time in an 8-inch wide path. The cost of the sail is also controlled because the sail surface can be made out of an inexpensive, lightweight laminated material, whose only job is to give the sail its 3-D shape. All the sail‘s strength comes from the dense grid of continuous high-strength yarns that are bonded to the sail‘s surface. Since the yarns run across the shaping seams, the seams are locked in place and cannot distort. 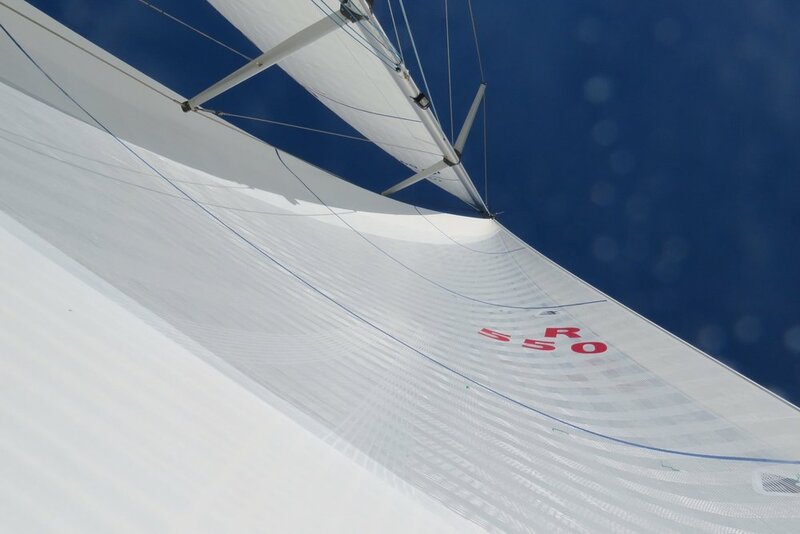 Due to the dense coverage of fibers, the sail is completely supported, which results in a smooth sail without distortion. Tapes with Endumax (UHMWPE) ribbons run continuously across the sail in all directions to lock in sail shape. Nearly the same performance as carbon, with all benefits of Spectra & Dyneema.